Ideal for connecting CD-ROM audio with this universal audio cable. Make the most of multimedia applications by choosing cables that deliver clean, noise-free sound. SFCable.com, the premier supplier of CD ROM-to-sound card cabling solutions in the industry, CD ROM audio cables with premium sound. SF Cable, the premier supplier of CD ROM-to-sound card cabling solutions in the industry. Making the most of multimedia applications by choosing cables that deliver clean, noise-free sound. Ideal for transmitting digital ID bit audio signals. The Power Y Splitter is most commonly used to supply power to internal 5.25 floppy drives, hard disk drives, CD-ROMS, and tape back-up systems. Application: Power Supply to CD-ROM/HDD Extension. With this cable you can supply power to two 3.5 in. floppy drives. 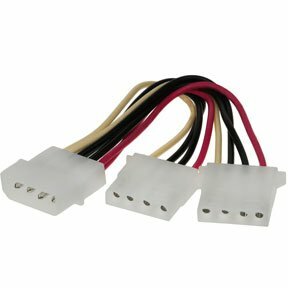 A wide range of power supply cables and adapters are available at SF Cable. All products are available for delivery at your doorsteps. We source our products directly from ISO 9001-2000 registered manufacturers to ensure that our customers are receiving only quality products which are safe to use. You can also expect good after sales service and lifetime technical support on all products at SF Cable.